Every morning I input the amount of time I spend on art. I break my time into three categories: 1. Actual painting or drawing time; 2. Marketing and networking; and 3. Studying. I try to spend a good hour each day on studying. Each day I put a new screen saver on my computer. Each time I get on my computer, I get a chance to scrutinize it. I study the masters from the past and the masters from the present. I belong to a number of Facebook groups that emphasize the pastel medium. I scan an impressionist page and a portrait page. This painting was a commission from a high school friend. High school was a long time ago, but with the brilliant invention of Facebook, high school isn’t that far away. My aim while painting was to stay loose and impressionistic. 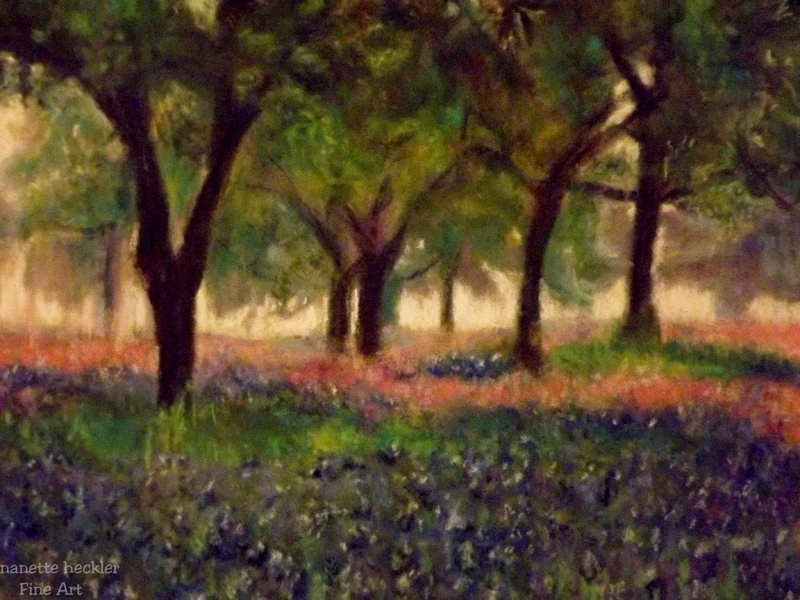 I didn’t want to depict each flower, but have my painting “read” Bluebonnets. I am happy with the results and my Texas client is also. Nanette Heckler, my friend, you are a fine artist! The sky is the limit for you as you follow your passion. I’m so happy for you, for where your’e heading in your artistic endeavors as well as for the family woman you are. Yeah for you! And of course, this piece of work is awesome. Glad your friend likes it!